Dutch John -- Take advantage of your summer travels and come see ospreys, in the air and on top of their huge nests, at the annual Flaming Gorge Osprey Watch. The free event will be held July 14 next to the parking lot at the Flaming Gorge Dam visitor center. The visitor center is in Dutch John, at the south end of Flaming Gorge Reservoir in northeastern Utah. Viewing runs from 9 a.m. to noon. "The birds are super active this time of year, especially during the morning hours," says Tonya Kieffer, regional conservation outreach manager for the Division of Wildlife Resources. "In the afternoon, the temperature climbs, the wind starts to blow, and the birds become less active." Kieffer says the Osprey Watch is a fun event for the whole family. And it's absolutely free. "While you're at the event," she says, "you may also want to take the Flaming Gorge Dam tour. If you take the tour, you might see some of the large rainbow trout that osprey love to dine on." Spotting scopes will be set up to enhance your viewing experience, and biologists will be available to teach you more about the life history of these unusual fish-eating birds. "If you're lucky," Kieffer says, "you might be watching right at the moment an osprey decides to dive feet first into the nearby water, only to emerge with a fish in its powerful talons. 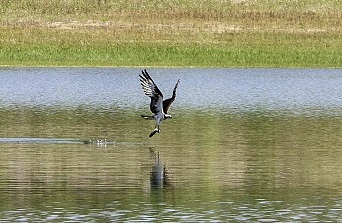 After capturing the fish, it will carry the fish back to its perch or nest and share it with its mate and young. You'll also hear the ospreys' shrieking calls as they fly all around us." In addition to ospreys, Kieffer says other birds of prey, including golden eagles, turkey vultures and American kestrels, are frequently spotted at the annual event. She says osprey are fairly easy to spot along any river, pond, reservoir or other body of water that contains an abundant supply of fish. "They have a distinct white head and a brown stripe that runs through their bright, yellow eye," she says. "These characteristics make osprey easy to identify." Kieffer says osprey are the only hawk in North America that eats a diet that's almost exclusively fish. "They catch a fish one out of every four times they dive," she says. "That's a great success rate." Osprey can log more than 160,000 migratory miles in their 10- to 15-year life span. And Flaming Gorge draws them like a magnet. "The largest breeding osprey colony in Utah, and one of the largest osprey populations in the interior part of the western United States, is found at the reservoir," she says. Kieffer says osprey return to Flaming Gorge every year to breed and raise their young. "A breeding pair will build on the same nest year after year," she says, "so a nest that's 10 feet tall is a fairly common sight at the Gorge. We'll aim spotting scopes at a couple of the nests so you can see the females and their young." For more information, call Kieffer at the DWR's Northeastern Region office. The number is 435-781-9453.